With a styling makeover, new hull and improved systems, our Australian correspondent David Lockwood thinks the new Riviera 37 raises the bar for off-the-shelf cruisers. The Riviera 37 is a refreshing cruiser from Australia's biggest boatbuilder. On one hand, it is an all-Australian boat with a good-sized cockpit in which to enjoy the great outdoors, a big flybridge from which to cruise for views and a very family-oriented interior. On the other hand, it is a worldly cruiser. Riviera is a big exporter with the lion's share of production heading overseas and dealers crying out for more stock. Influenced by foreign tastes, Riviera has become more than an Australian company and the name has never been as suited to a cruiser than the 37. Of all the past-generation models, the Riviera 36 was considered one of the best travellers. The new 37 replaces this boat and is better again. It has a more modern hull, dressed with what the company calls "millennium styling", which means rakish, flowing lines and a distinctly more Euro look. The 37's proportions also contribute to its appeal. It's not too big, not too small and, due to its user-friendly but voluminous size, is at once perfect for couples, families and entertaining. Add some poles and game rods, and you can fish tournaments. It just may be the perfect off-the-shelf all-rounder. The first thing I looked at was the lockable engine room. 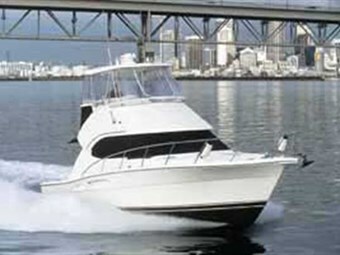 The heart of the Riviera 37 seems to feature cleaner laminates and gelcoat, and an improved finish. It is definitely better designed than previous models, with much more emphasis on engineering and accessibility. Access is still gained by swinging open the moulded cockpit sink and climbing down a small ladder. Unless I was mistaken, I couldn't find a catch to keep the unit open, and the door swung to and fro as the boat bobbed on the passing ferry wake. With the base engines - twin Cummins B330s - there is a surfeit of servicing room. I guessed there was 30cm to spare over the highest point of the Cummins and in most spots, it was more like 45cm. Both sides of both motors can be accessed easily. Engine options currently range up to twin 350hp Cummins. Day-to-day maintenance is aided by positioning the strainers, filters, oil taps and so on near the engine room door. The boat comes standard with a 7kw freshwater-cooled Onan genset, with muffler and its own starter battery. There is a 40amp auto battery charger, high-water, engine-temp and low oil-pressure alarms. You might also notice all the wiring is now coded and numbered. The Onan is easily accessed forward of the motors, where the Kirby fridge unit, battery banks, hot-water system and an internal wash down can be found. Twin polypropylene water tanks outside the engines collectively hold 405l and are linked to a gauge where you want it - in the galley. The soundproofing looks substantial, and there are watertight bulkheads fore and aft of the engines. The fuel tanks hold 1100l. That's OK, but some 37 owners will probably want a bit more juice for long-range work. Perhaps Riviera can add another 400l or so up forward. The hull is all hand-laid fibreglass with a solid keel and chines. There is a watertight collision bulkhead in the bow and a weight-conscious foam or balsa-cored superstructure for improved stability. The boarding platform has cutouts to prevent slap when backing up. Keen game fishers will no doubt remove the platform and go for the stainless step protector on the marlin door. In any case, the big marlin door grants terrific access to the water for morning swims. Teak on the cockpit sole is an option, but probably a must-have for most buyers. Anglers will go for the spread of five heavy-duty Reelax rod holders. An in-transom live-bait tank with a big window holds plenty of potential for fishermen. There are four storage hatches in the cockpit sides - one with a freshwater (hot and cold) deckwash, another with a seawater tap and two big side lockers that cut back under the coamings. There is a useful fish box with an overboard drain and pump under the cockpit floor on the port side. On the starboard side, you gain additional access to the lazarette, which can also be accessed through the main central hatch. The storage hatch near the saloon door is a beauty and the gear kept inside is easily accessible. Meanwhile, under the bridge ladder is a useful service centre comprising a big eutectic cockpit fridge/freezer, storage shelves for bait-rigging gear and the aforementioned sink that swings open to grant access to the engine room. There are no hawse-pipes and cleats under the deck, but you get semi-recessed designer cleats in the transom corners. You also get pop-up fender cleats, snubber cleats, a solid large-diameter bow rail and side rails around the cabin. The steps up from the cockpit help you on your way forward and you can feel the non-skid on the decks taking hold. Up front, the windlass is a new compact Muir model and the foredeck has chain and rope lockers, seawater washdown and stylish circular deck hatches. There is also room for a rubber duckie or life raft. In this would-be skipper's opinion, the bridge is the highlight of the new Riviera. The layout is so much cleaner than the old Rivs and the amenities that much better. The optional moulded-fibreglass hardtop makes the station. It's supported by large-diameter stainless tubing, and includes an overhead radio box and handy hatch for fresh air. The view from the raised helm seat to the bow and cockpit is excellent. The clears are the top-shelf Vibak brand, which feel lovely and thick when you roll them up. 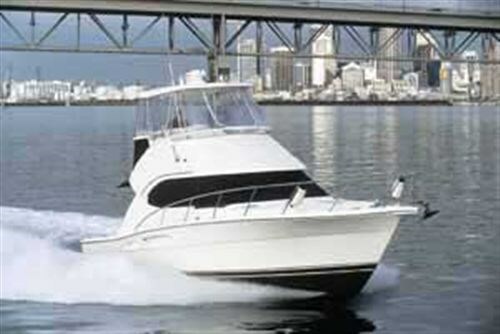 But, as a fishing boat, the 37 is best without the rear bridge awning. "Contemporary" best describes the new console, which has carbon-fibre inserts, thoughtfully moulded dash panels and recessed space for flush-mounting electronics. The VDO gauges (re-badged Cummins) are chic chrome-rimmed numbers and the switchpanels are improved waterproof types. Ahead of the console, there is seating for guests on a forward-facing lounge that, at a pinch, is wide enough to sleep on. 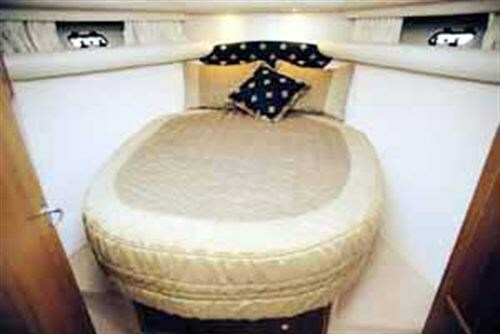 Storage space is generous - under the lounge, in the flybridge brow and in a cupboard ahead of the co-pilot. The interiors of the new-age 37 and 40ft Rivieras are cheerful, uncluttered, elegant and traditional in parts. You can choose from a range of interior designer packages, from scatter cushions and lounge upholstery to bedspreads, linen and bathware. This particular boat has bone-coloured carpet, and soft-touch wall and ceiling liners, with joints and joins nicely finished. There are cream pleated curtains and camel-coloured leather lounges. The neutral colours make the teak spring to life. Step inside the saloon door and the master circuit board - with more sophisticated and logical wiring than before - is immediately to starboard. It is recessed in a teak cabinet that has an optional U-Line fridge and icemaker. 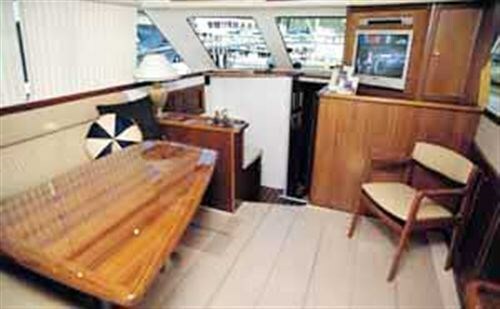 A loose chair fills the void where you once might have stood at the lower helmstation and a big teak cabinet with an impressive entertainment centre is set under the windscreen on the starboard side. Pretty much everything here is optional, but you would be doing your Riviera 37 a disservice by not fitting a CD stacker, 51cm flat-screen television and DVD player. A cabinet alongside is designed to hold CDs and movies, while an overhead alarm panel alerts you to anything awry with the boat's plumbing or electricals while you are tucked away inside. The big L-shaped lounge to port seats five people. By no means a small thing, the Riviera 37 comes with 16,000 BTU reverse-cycle air conditioning in the saloon. A second unit serving the two cabins is optional, as is a lower helmstation, entertainment cabinet and opening saloon windows. My advice? Go for one helm, the entertainment centre and no opening windows (no leaks), and leave the saloon door and opening rear window open if you must. The galley is two steps down on the mezzanine level. The servery is low enough to let you chat with lounge lizards in the saloon and even allows a partial view out the saloon windows. An L-shaped Granicoat bench top offers ample food-prep space and a big circular sink - with stylish single mixer - lets you stack plates and leave the washing up till later. Aided by the eutectic freezer in the cockpit, the 12V DC/AC fridge is big enough to serve weeks at a time and also includes a vegie crisper compartment. A better system of stainless catch is used on the fridge door - the old plastic clips were a pain. There is a dedicated cutlery drawer and a huge under-sink storage compartment with a shelf. The idea here is to load up the area with baskets containing cooking utensils, food stuffs, washing-up gear, and some plate and coffee-cup racks. Set in the mock-teak Antico flooring, a big hatch leads to a hold for victuals, though they must be kept separate from the air-conditioning unit. Put it all together and there is a lot more space than may be obvious. Standard appliances include a two-burner electric cook top, convection microwave (opposite the galley in a teak facia) and exhaust fan. In other words, there's everything you need to whip up a dinner party, but many crews might also opt for a spigot-mounted barbecue in the cockpit. The two-cabin, single-head accommodation layout under the Riviera 37's foredeck is made to measure. Each cabin is big enough to be truly liveable and the head has as much space as in boats twice this size. The guests cabin has twin bunks big enough to sleep in. There is a lot of floor space or dressing room, an overhead circular hatch, soft-touch wall liners, hanging space and two drawers, and neat blue bedspreads with a gold leaf motif, piping and matching pillows. Opposite, the single head is again big on floor space. The moulded liner includes Granicoat mock tiles, a full shower stall with chic mixer and shower head, and a one-piece vanity with sink. There is an extractor fan, a big circular hatch, shelves and two mirrors. Last but not least, the master cabin in the bow has that signature Riviera queen-size island berth with an innerspring mattress and access around all sides. There's storage beneath the base that lifts on gas struts, soft-touch padded walls and sidepockets. The hanging locker is exceptionally deep with three shelves and a separate storage locker is recessed in the wall. It wouldn't take long to work out a mounting spot for the television and there are reading lights, portholes and a big round hatch, but the big teak bulkhead awaits a maritime painting or two. There is an air of excitement about driving the Riviera 37. The Cummins' seem like clean-running quiet motors, and the boat responds to the throttles by turning in its length in the busy marina arm and idling out to the harbour at 680rpm. While Americans like the feel of the Hynautic throttles, which click into various incremental positions, some say they can make it difficult to synchronise the motors and sometimes your ideal speed may be between increments. The Cummins had no trouble getting the 37 with full fuel and water onto the plane. Lure-trolling speed of around 8.5 knots is reached at 1200rpm and at 1800rpm, the boat starts shifting onto the plane. There is no big transition and at 2000rpm the hull is happy to run flat for a low-speed, heavy-weather cruise of 14.5 knots. More likely you'll run at 2200rpm, which gives 20 knots, or 2400rpm, which delivers 24 knots. A top speed of 27.5 knots is attained at 2800rpm. It was a fleeting drive of the Riviera 37 but for what it's worth, the boat seems dry quartering the wind. And its handling is predictable and easy to master, even for those stepping into a cruiser for the first time. With 167 Riviera 36s sold to date, the new 37 is poised to take centre stage. It is sure to attract a big following at high-profile marinas all around the world. Riviera NZ has delivered its first 37 and has another two ordered for delivery this year. Bruce McGill says the 37, like all new Riviera models, has attracted plenty of interest in the local market, a fact recognised by the Australian manufacturers who are gradually supplying more product to their New Zealand outlet. As well as those already ordered, McGill's office is processing applications from eight potential 37 owners. "We think we're good for three or four 37s a year," said McGill. "This year, we will have put 21 new Rivieras into the New Zealand market - that's an all-time record." Five of the Riveria 40, launched at last year's Sanctuary Cove Boat Show, are now cruising New Zealand waters and McGill already holds three deposits for next year's model - a revamp of the 58 design, due here next April/May.